Critics of globalization say free trade and cross-border investment have benefited the rich at the expense of the poor. They argue that the ranks of the poor are growing, and that the disparity between rich and poor has grown. The truth is more cheerful, says Xavier Sala-i-Martin, an economist at Columbia University. 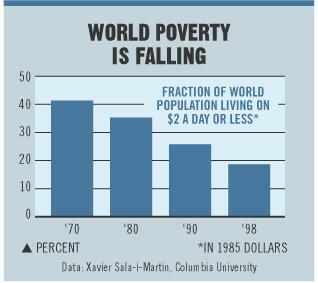 He calculates that the fraction of the world's population below the poverty line (defined as an income of $2 a day in constant 1985 dollars) fell to 19% in 1998 from 41% in 1970 (chart). Overall inequality has decreased as well. One way economists measure inequality is by the Gini coefficient, a zero-to-one scale on which zero means each person in the world has the same income and one means that a single individual collects the world's entire income. Sala-i-Martin estimates the world's Gini coefficient fell to 0.63 in 1998 from 0.66 in 1970. Rising incomes since 1980 in China and India, the world's most populous nations, account for most of the improvement. In contrast, poverty worsened in Africa. In 1970, 11% of the world's poor were in Africa and 76% were in Asia. By 1998, Africa's share of the poor had risen to 66% and Asia's had fallen to 15%. Latin America was neither as good as Asia nor as bad as Africa: Poverty in Latin America decreased in the 1970s but has changed little since then, Sala-i-Martin calculates. Most previous studies of global income inequality compared national average incomes. But such an approach neglects that countries have different degrees of income inequality within their borders. Sala-i-Martin says his study, published as a working paper by the National Bureau of Economic Research, uses the most detailed estimates yet of the income distributions within countries. It covers about 90% of the world's population, excluding countries for which 30 years of data don't exist, such as Russia. While Sala-i-Martin focuses on the good news, he writes that "the number of poor is still embarrassingly large." In 1998, he estimates, 350 million people scraped by on less than $1 a day (in 1985 dollars) and nearly a billion people lived on less than $2 a day.